The AUTOMATIC X4 is SEBO’s 12 inch wide, full sized upright vacuum cleaner with a long list of features for today’s busy households. They specialize in building commercial grade vacuums that can withstand many years of use. While you will pay more for one of their machines, you will likely spend less money in the long run as you won’t be replacing it every couple years like the cheap cleaners you find at local ‘big box’ stores. A SEBO is for people who understand the importance of having a clean house and want to have the best tools for achieving that. One of the first things you will notice when you start vacuuming is just how quiet the X4 is. Many hours of sound dampening design have gone into their X series and it is very noticeable. Some brands will leave your ears ringing after use, or force you to shout to family members when using them but that’s not the case here. You can almost talk on the phone while you are doing your weekly cleaning chores. They are dubbed The World’s Best Pet Vacuums for several reasons. First they have a uniquely designed power head that can pull stubborn hair up and out of carpet fibers. This is one of the most difficult things to do, especially when there are multiple animals in the home, but the X4 really does a great job. As a matter of fact, it comes with a seal of approval from The British Allergy Foundation. This is largely accomplished via a ‘hospital grade’ filtration system that is sealed so tightly that almost no dirt or dust can escape. Their engineers run all of their testing on the X4 while it is running (not something most manufacturers do) to measure the filter effectiveness when it matters most. Here is a short video SEBO put out to demonstrate the best qualities of this vacuum cleaner. It shows just how effective it can be in and around the obstacles in your home. 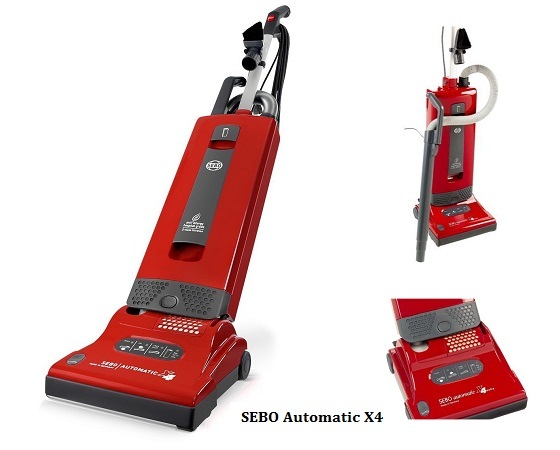 Really the only downside we found with the SEBO X4 is the price but when comparing it to other ‘higher end’ cleaners, it is right inline with them in terms of cost. You also have to remember that you will get many years of use out of it, and likely would have had to replace numerous other uprights in the same time as just one SEBO. And you get much better cleaning performance on top of that! If you want to learn more about it, and read online consumer reviews, click here to visit our favorite online retailer.